There's no doubt about it, getting your article on the FRONT PAGE of any major news publication is quite a coup. It puts your work in front of thousands if not millions of readers. It creates a terrific boost to your portfolio and elevates your status among your peers. It frequently leads to juicy assignments, Profitable syndication deals, Major advertising interest and opens doors to VIP and celebrity access. 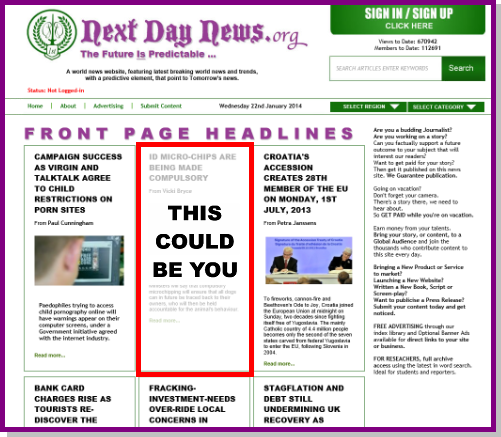 This has been the experience of Journalists, Writers and Contributors to nextdaynews.org when their work gets chosen for the FRONT PAGE. So how can you ensure your work is a contender for this coveted slot...? Every day, our Editorial team review all the new submissions to the site over the past 24 hours. From the hundreds of submissions, we select 48 possibles. WOW, Thatʼs a stunning Picture...! How good is the Art that youʼve chosen for your article? Whether its a graphic, a picture or video link, it should add to the dramatic presentation promised in the Headline. The FACT-CHECKING: Quotes, sound-bites, attribution. Does the writer know his stuff, is he guessing or can he back-up every statement in the article. THE PREDICTION: This is really the make or break for an article chosen for the FRONT PAGE of nextdaynews.org. The reputation of our news site is built on the quality of an informed prediction.This is where the writer has skillfully taken the reader from the announcement of a current news event, introduced historical precedent, weaved in trends from related events and brings it all together in a conclusion that points to an accurate prediction about what is likely to happen next. These 48 Articles then receive a RATING based on each of the criteria laid out above. At this point, they're sent upstairs to the Senior Editor. His job is to select the 12 of those 48 articles that most closely correspond to the current news cycle that is trending in most peoples minds where they are actively seeking out the stories and information that have caught their interest. This is all about timing, catching a wave, sometimes pre-empting a story before it goes viral. He will choose the 12 most likely candidates and 6 back-ups. The 12 writers will be contacted by the Senior Editor to let them know their articles have been chosen. It is a condition of publication that a Front Page article MUST have all 12 ad blocks filled. Because business people, political and social agencies, will not want to associate themselves with anything less than a professionally written and well-presented piece of work. The rule-of-thumb is simple. The better the work, the more likely you will attract the advertisers. So if the advertisers like it, so will the public. ALL ARTICLES START OUT IN THE ARCHIVE. Some of our Contributors assume that just because their articles are not chosen for the Front Page the day after submission, they have missed their chance. But that isnʼt the case, some articles are chosen months after submission because their particular subject matter has suddenly hit the headlines. All submitted articles stay online for 12 months following the date of publication. At any point, during that period, you could make the Front Page. So, donʼt panic just because it doesnʼt happen straight away. Keep building your portfolio with us. Keep building your advertising until your article page is full. Keep widening your circle of contacts and update them on every new article published. When you do get picked, you will be told. So spread the word. Especially let your advertisers know. They wonʼt hesitate to put business your way in the future. Once the Front Page is ready, it gets mailed out to our entire data-base of Site members, which includes most periodicals, dailys TV and News Sites across the Internet.